Our solar system's planets may have formed at differing times, determined by shock waves flowing from the young sun, one astronomer suggests. This theory posits that Earth is one of the youngest planets in the solar system, along with Mercury, Venus and Mars. In a new paper, Tagir Abdylmyanov, an associate professor from Kazan State Power Engineering University in Russia, describes his idea and suggests it presents a possible new way of predicting where planets will form in young star systems. "Studying the brightness of stars that are in the process of forming could give indications as to the intensity of stellar shock waves," he said in a statement. "In this way we may be able to predict the location of planets around far-flung stars millions of years before they have formed." Abdylmyanov adapted his own mathematical models by adding a solar system formation theory proposed by Japanese astrophysicists in 1985 in the book "Protostars and Planets II," a University of Arizona publication that detailed planetary theoryat the time. In the decades-old paper, the Japanese scientists suggested that the solar system began with a solar nebula that gradually evolved to form clumps of dust that gelled to make protoplanets and then planets. Abdylmyanov takes that research a step further and says the planets formed at different times instead of at the same time. Solar shockwaves would have produced proto-planetary rings at different times, meaning the planets did not form simultaneously. From modeling fluid and gas bits inside the solar nebula, Abdylmyanov theorized that the movements of these particles created shockwavesas the sun evolved and sent energy out into the young solar system. Each series of shock waves generated a new set of protoplanets, he suggests. "We assume that the modern distance between the orbits of the planets is the result of action of the shock waves and the solar activity at the stage of star formation," he wrote in his paper. 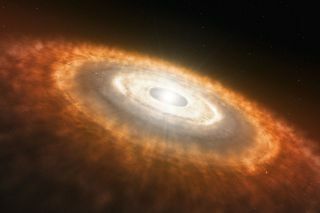 The first series of protoplanetary rings, formed at about the same time as the sun, eventually created Uranus and Neptune, Abdylmyanov suggests. About 3 million years later, the sun would have generated the debris ring that became Saturn, and in half a million years more, Jupiter's debris ring might have come to be. Subsequent shock waves could have produced the asteroid belt and then the protoplanetary rings for Mercury, Venus, Earth and Mars. Abdylmyanov's own research, he wrote in the paper, shows that gas and dust accretion could cause "accelerated formation of planets" from these protoplanetary rings. Acceleration would likely favor the formation of only one planet out of the ring, instead of several, he said. "As a result, within each of the protoplanetary rings could be formed only one dominant planetesimal, namely the planetesimal of planet," he wrote.